Dragon Age: Inquisition details from the latest Official Xbox Magazine spills the beans on the game's number of endings, areas, how there will be no "DLC Companions," and more. Update: BioWare's Mark Darrah has gone to the official BioWare forums to offer a bit more clarity on the 40 endings the game will allegedly have. 1. Minor variations based upon choices you make in the game or previous games. There are HUNDREDS of these variations. Based on Darrah's post, it seems expecting 40 radically unique endings might not be in the cards. But then again, that really wouldn't be feasible now, would it? Nonetheless, 40 "major variations" on the game's conclusion is no small feat. Let's hope it delivers. Source: BioWare Forums/Thanks for the tip, Starblazer117! Excited for Dragon Age: Inquisition? 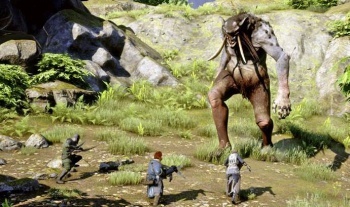 You'll be glad to know that a ton of info regarding the action-RPG has made its way online courtesy of BioWare forum user "Jaldaris93" who has posted details straight from the Official Xbox Magazine's latest issue. First up, the big one. According to the magazine's info, "Bioware is promising a staggering 40 possible endings for the game, dependent not only on choices made in character generation but by actions taken throughout the storyline. [Mark] Darrah stresses, however, that the endings will all be meaningfully different from one another. You won't find 40 endings with only slight degrees of variation between them." Other details like the game's regions, dialog wheel, how there will be no "Companion DLC," and more can be read below. - 2 of the areas you can expect to visit are; a war-torn region in Orlais and an elven burial ground, known as the Emerald Graves. - The Emerald Graves, according to executive producer Mark Darrah, is where the Dalish Elves planted one tree for every soldier killed in the Exalted Marches. - According to the magazine, while enemy levels don't scale to your characters, you can affect environmental changes to drastically influence local settlements, establish trade routes, capture territory and disrupt the local ecosystem. - Wild flora and fauna, useful for crafting can be hunted to scarcity, allowing other species to proliferate. Defeating intelligent enemies like bandits or dragons will have a significant effect on a given region. - There will be no DLC Companions: According to Creative Director Mike Laidlaw: "Because of how deeply enmeshed in the system companion characters are, we can't just add them on the fly; part of them has to be shipped on the disc...which was led to criticism that we're forcing people to pay for content they already own. It's not the case, but we've decided this time to not go that route. There will be no DLC party members." - Solas is an apostate and an expert on the Fade. - The Iron Bull is confirmed as a companion, who is described as "a one-eyed mercenary and outcast from the Qunari faith"
- Sera is confirmed as a companion, and is described as "an elven archer. Little is known about them [referring to both Sera and the Iron Bull] at this point, particularly Sera, who turned up seemingly on accident during one of several combat demonstrations..."
- "We have three wheels that we use in response to any given piece of dialogue" says Gaider. "One of those is what we call the 'tone wheel', which is mostly for role-playing choices. The other two are the 'choice wheel'- for taking an action or stating an opinion-and the 'reaction wheel,' for emotional moments"
- To address why the same voices apply to all races, Mike Laidlaw made the following statement: "It's a matter of file size...if we were to have eight voices, two for each race, we would be shipping on 14 discs or something. We figured that with four voices, that would give players enough options while staying within our size limitations"
- BioWare is currently exploring options to differentiate the voices, like changing the pitch of the audio. - The Prologue Section (or the "Origin" section" will be the same for all players. The player's appearance, class and dialogue responses during the prologue section will fill in the details, presumably of the Inquisitor's background, and in particular inform how other characters respond to you throughout the story. - The Inquisitor is the sole survivor of a reality-shattering event which results in the Fade tearing opening throughout Thedas. - "Presumbly as a result [of the Fade tearing open throughout Thedas], you're also endowed with a singular ability: you can close these rifts wherever they appear throughout the continent." - There will be a jar of bees, which can be used as a combat item which according to Bioware: "You throw it, the jar breaks open, and little bees fly around stinging your opponents." Seeing as the forum post hasn't been taken down and the user hasn't been suspended by BioWare's mods, the chances of the info listed being real are quite high. Now, hopefully, these 40 endings are really "meaningfully different" from each other and not just, y'know, color changes. Dragon Age: Inquisition is set to hit PCs and consoles later this year.